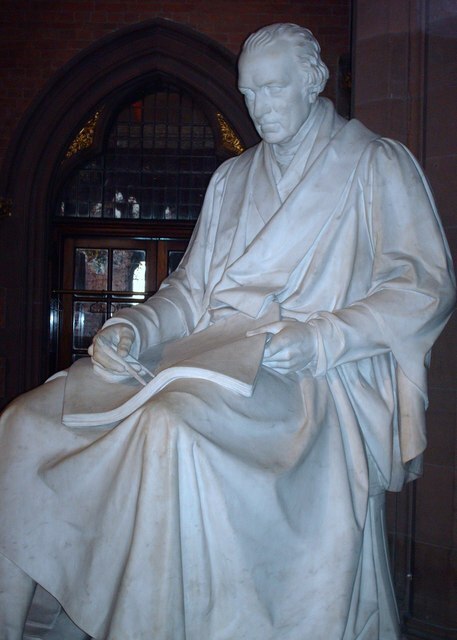 This statue of James Watt was sculpted by Chantrey. This NT2574 : Royal Bank of Scotland is the only building on the Square with a front garden. Not originally built (1771) as a bank, but as a mansion for Sir Laurence Dundas and apparently based on TQ1773 : Marble Hill House. There's a story that Sir Laurence lost it in a card game, but so wanted to keep it that he had a house of equal status built for his adversary. It should have been the site of St Andrew's Church, to match St Georges NT2473 : West Register House, now West Register House, at the other end of George St, on Charlotte Square, but Dundas got there first - 'early example of the triumph of land ownership over good planning'. The superb Telling Room was added in 1857. The equestrian statue is of John Hope, 4th Earl of Hopetoun, with an inscription by Walter Scott, whose monument (fondly known as the 'gothic rocket') is on Princes Street at the south end of St David St NT2574 : St Andrew Square, West Side. The story goes that the statue was never paid for, because the horse and man are disproportionate in size, having been made in different workshops. It apparently took 10 years to complete - you'd have thought they'd have noticed the discrepancy! !